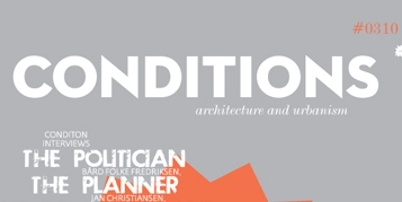 Edition 3 of dynamic new Scandinavian Magazine CONDITIONS features an article from Gerard Reinmuth on Sustainability. This magazine is a brilliant publication with provocative articles from the new generation of architects and thinkers. In Gerard's article, sustainability is discussed as an aesthetic problem in a broad sense and in the context of a Scandinavian tradition.